How well do we really know our friends, and how strong are those bonds when they’re tested to the limit? These are two of the questions C.L. 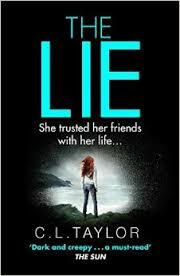 Taylor’s latest psychological thriller prompts the reader to think about as they follow the dual storyline narratives of The Lie to their explosive conclusion. The story pulls you in straight away, and the flowing narrative holds you captive until the final page has been turned. It’s a story packed with tension, twists and turns, immersing you into Jane’s world and feeling the fear inside her building as she’s contacted by someone who can’t possibly be alive. Or can they? Deeply unsettled, Jane relives the horror of the past through a series of flashback chapters which transport her (and the reader) back in time to the ‘trip of a lifetime’ she took with her then best friends – Daisy, Leanne and Al – to Nepal. As they travel from their hotel to a remote retreat in the mountains it soon becomes clear that the ripples of tension and jealousy within the group are rising, and it’s not long before the friendships start to unravel with devastating consequences. As the creepy, shocking truth (and serious danger they’re in) becomes more apparent in the Nepal timeline, the threat level in the present escalates to a critical level. I can’t really say much more about the story without giving away some of the excellent twists, but what I will say is that C.L. Taylor has brilliantly captured the complex and changing dynamics between the four young women on their adventure turned nightmare, bringing them to life in a wholly believable (and therefore very scary!) way. Jane is a wonderfully complicated character – she’s passionate about her job at the animal sanctuary and determined and bold in dealing with the difficult characters she encounters, yet claustrophobic and terrified into panic when a trigger to a memory from the past is pressed. She’s a character that I found myself really caring about and rooting for. High drama and high stakes, this is a real pulse-pounder of a psychological thriller and a must-read for 2015.